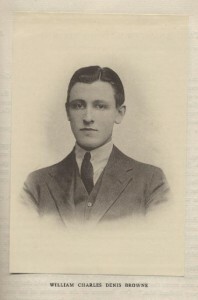 Born in Leamington in 1888 to distinguished Anglo-Irish parents, William was educated first at Greyfriars Preparatory School in Leamington, and although he won a mathematics scholarship to Harrow, he chose instead to take up a classics scholarship at Rugby School, where he met his best friend and later comrade-in-arms, the poet Rupert Brooke. By the age of 15 William was running the choir and playing the organ for all Sunday services at the family Church of St Mary Magdalene in Lillington. He was similarly involved in the musical life of Rugby School, and later, that of Clare College, Cambridge, where from 1910 – 1912, he was Organ Scholar. Whilst at Cambridge both Rupert and William were active in student productions. They rubbed shoulders with many of the prominent writers, performers, musicians and composers of the day. William studied under a number of the foremost composers and practitioners of the time, and rapidly gained a reputation as pianist, accompanist, organist and conductor. The distinguished composer Ralph Vaughan Williams said of him in 1911 that he had “A most musical nature and his artistic judgement and perception are remarkable”. On graduation in the summer of 1911, William secured appointment at Repton School as assistant music master and organist. In 1912, he made a trip to Berlin, to study briefly with the renowned Ferrucio Busoni. Unfortunately, overzealous practice caused neuritis, threatening paralysis of his hands, and on his return to England, William resigned his teaching post at Repton and moved to London, where in January 1913, he became organist at Guys Hospital and conductor of the musical society. At Guys, William supplemented his income by deputising for Gustav Holst at Morley College, and conducting Choral Societies in London and Surrey. He also wrote for John Middleton Murray and Katherine Mansfield’s Blue Review and contributed occasionally to The Times, The New Statesman and The Daily Telegraph as a music critic. He continued to compose and perform prolifically, and on Palm Sunday 1914, William’s eight-part Nunc Dimittis was performed at Westminster Cathedral. In May, he gave the London première of Anton Berg’s Sonata Opus 1, and a lecture entitled Modern Musical Tendencies before the Musical Association. In July William accompanied Stuart Wilson in a recital at 10 Downing Street. The Comic Spirit, a ballet-pantomime, intended for Bristol’s Theatre Royal, remained unfinished when war was declared in mid-September 1914. 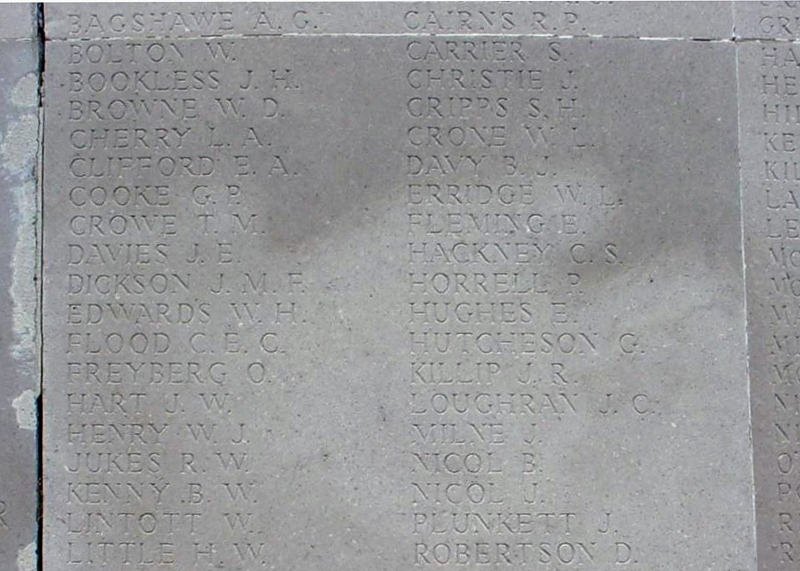 By this time, William had returned to Cambridge to complete his M A,, but both he and Rupert Brooke dropped everything to try and enlist in the armed forces. Edward Marsh, an old friend who had become private secretary to Winston Churchill (then first Lord of the Admiralty) managed to engineer commissions for both men in the 8th (Anson) Battalion 2nd Naval Brigade in the newly formed Royal Navy Division. Later that year both William and Rupert Brooke took part in the defence of Antwerp alongside remnants of the Belgian army. German forces swept through the town and on 8th October, the Belgians fled. A substantial number of Royal Naval Division troops and Belgians were interned in the Netherlands for the duration of the war, but William and Rupert Brooke considered themselves fortunate to be transferred to the 7th Hood Battalion to join the force assembling for the Gallipoli landings. After five months’ training, they set sail for the Dardanelles in February 1915. En route to the Dardanelles, as a result of a mosquito bite, Rupert Brooke developed Septicaemia, and died off the coast of Skyros, where William Browne buried him in an olive grove. In a letter to Edward March in April 1915, William described how he sat with Rupert as he grew weaker, and died in the late afternoon, “with the sun shining all around his cabin and a cool sea-breeze blowing through the door”. William felt that “no one could have wished for a quieter or a calmer end than in that lovely bay shielded by the mountains and fragrant with sage and thyme”. By the end of April 1915, with the onset of the battles of Krythia, William Browne the musician had become William Browne the very active soldier. In May 1915, in the second battle of Krythia, he was shot in the neck. After brief recuperation in hospitals in Cairo and Alexandria in Egypt, and barely fit, William returned to action at the beginning of June. Almost immediately, he was injured a second time in the third battle of Krythia, when, as he jumped into an enemy trench, he was shot in the shoulder and stomach. As he could not be moved, and knowing the likely outcome, William simply passed his pocket book to a Petty Officer to be returned to his family. His body was never recovered. When the pocket book was returned to his parents, they found a farewell note, written in the trench on the day of his death, 4th June He had written, “ I’ve gone now, too; not too badly, I hope. I am luckier than Rupert because I’ve fought. But there’s no-one to bury me as I buried him, so perhaps he’s better off in the long run”. William’s death notice in the Leamington Courier on 18 June 1915 fittingly quoted Horace writing about Qunitillian: “Multis ille bonis flebilis occidit”, – (“He fell lamented by many good men”), explaining that only those who like the author of the notice had had the opportunity of being intimately associated with WCD Browne could fully appreciate the beauty of his character in which simplicity and dignity was so happily blended. Sadly, in a letter some time earlier, William had written to Edward Dent, his former tutor, asking him in the event of his death, “to destroy any compositions that did not represent Denis Browne ( the name by which he was known to his friends and wider circle) at his best”, and so, aided by Ralph Vaughan Williams and Stuart Wilson, Dent destroyed many of his early pieces of work. Those compositions that remain are held in the archive of Clare College Cambridge and the British Library in London. Many are still performed and are available on CD. At the beginning of June 1915 Edward Marsh, unaware of William’s death, travelled from London to Leamington to visit William’s mother and sisters. Before leaving, Edward wrote William a letter, destined never to be read. Once he learned of William’s fate, a grief-stricken Edward feared that William’s mother would blame him for William’s death, as he had pushed for the commission that took him to the Dardanelles. His fears were unfounded, as Mrs Browne assured him that she did not blame him in any way. She expressed her gratitude for what his friendship meant to William, saying that she was conscious only of the happiness which it brought into the lives of William and his companions. Grove’s New Dictionary of Music and Musicians describes William as “ a brilliant musical mind. His posthumously published songs are particularly beautiful and the ballet suggests a rare ability to absorb new idioms”. 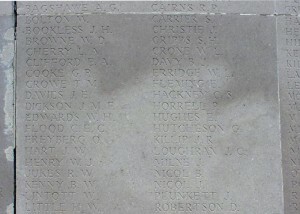 William is commemorated in a number of locations: – on the Roll of Honour, Rugby School, on panel 8 of the Helles Memorial in Turkey, on the War Memorials in Euston Place, Leamington, St Mary Magdalene, Lillington, St Paul’s Church, Leamington, and Clare College, Cambridge His name is also recorded at Guy’s Hospital and the Royal Naval Division War Memorial in Horse Guards Parade in London. For their support and help in researching and compiling this article and their permission to reproduce images, I am immensely grateful to Nick Peacey, Robert Athol, Rusty MacLean, Paul Stevens, Steve Cork, Guys Hospital London and the Commonwealth War Graves Photographic Project.